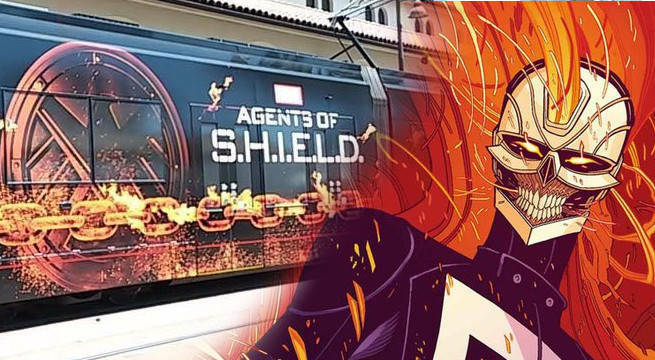 Is Agents Of SHIELD Casting Ghost Rider After All? Maybe Ghost Rider is coming to Marvel's Agents of S.H.I.E.L.D. after all. Earlier this month, an Agents Of S.H.I.E.L.D. Comic-Con advertisement on the side of a San Diego light rail showed some fiery chains. Most fans assumed that the fiery chains belonged to Hellfire who’s got a long history with Agent of S.H.I.E.L.D.’s Skye. After all Hellfire’s alter ego James “J.T.” Taylor did make a brief appearance on Agents Of S.H.I.E.L.D. Season 3. Not only that, but Hellfire does share some roots with the original Ghost Rider. Most fans ruled out the possibility of Ghost Rider assuming the special effects required would either be too expensive for TV or that Marvel would want to save the character for Netflix where they could take a darker tone than network TV. However, a new casting notice suggests that Ghost Rider might actually be coming to Agents Of S.H.I.E.L.D., even though it might not be the one that most fans might expect. Most people know of motorcycle-riding Johnny Blaze Ghost Rider, which is the version Nicolas Cage played in the movies. However, there are other versions of Ghost Rider that have appeared in the comics. The characters in the casting notice are listed as a pair of Latino brothers. One is classified as "the most dangerous person in the room" and the other is "paralyzed in a wheelchair". If that sounds familiar, it's probably because it bears an eerily close resemblance to Robbie and Gabe Reyes, who starred in the 2014 Marvel NOW! Ghost Rider series. The series, by Felipe Smith and Tradd Moore, was a new take on Ghost Rider focusing on the brotherly bond between its main characters Robbie and Gabe. Robbie has a natural talent for mechanics, but nothing is more important to him than the health of his disabled brother Gabe. In addition to the classic powers we've come to know, Reyes also had access to the Hell-Charger, a hellfire imbued 1969 Dodge Charger. Robbie gets his powers after an unfortunate run-in with Dr. Zabo's hit squad costs him his life, blowing up a car in all the gunfire. Ironically that car is what allows him to come back, as the spirit of Eli Morrow gives him new life and his new powers. It would be an interesting addition to the show, and if you're going to bring in Ghost Rider, this is certainly a unique way to do so. Also, keep in mind that Agents of S.H.I.E.L.D was shifted back to 10 PM to allow the show to have an edgier tone.